I wanted to read more this and last year, but somehow felt that I never have enough time. Here's How You Can Find More Time to Read More Books. I thought this article, Bride Mistakenly Invites Strangers to Her Wedding, very funny. How to Design A Life You Love is such a great post with lovely life lessons. 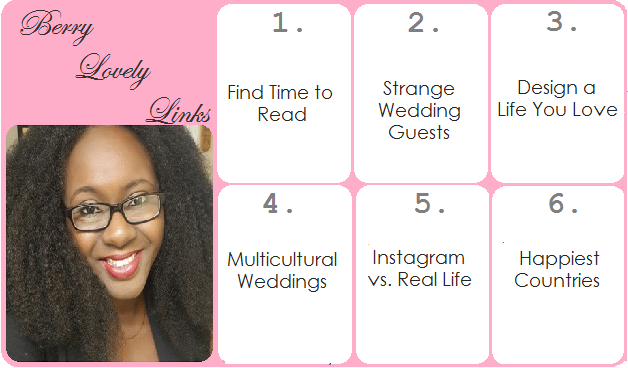 I can attest to some of these 8 Things I Didn't Expect to Deal With at My Multicultural Wedding. Y'all know Instagram isn't life, right? Check out this girl's article What I Instagrammed versus What Was Really Happening. Who can guess The World's Happiest Countries? Ah! We do love our public holidays in Nigeria, I usually start the new year flipping through my calendar, counting the public holidays. The 4-day Easter weekend has been great so far, if only it wasn't tainted by the fuel scarcity palava. Still, we are grateful for small mercies. Thank you for sharing the links, off to read. Lol, my friends and I always joke around with Hamrika. Luckily there are a few random public holidays here too but not as many as in Nigeria. I remember in 2014 most of my time off work fell around public holidays, so I had like 6 extra free days. So cool! I've been hearing about the scarcity o. I really wish Nigeria would change for the better already. It's so discouraging. Honestly! Even when people say they're envious of Cakes' and my relationship, I almost shake my head cos they seem to forget that we have down and sometimes awful times.